The white marble tombstone above has a closed book carved on it resting on top of a draped square column. In Victorian times, heavy black drapery was used during funerals. The use of it here represents mourning. 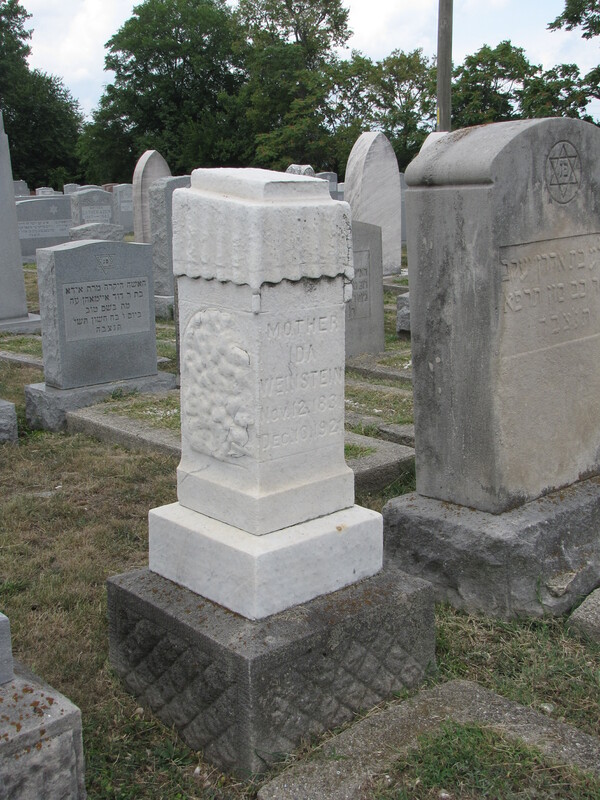 What is unusual about this tombstone is the fact it is in the old Jewish cemetery at Indianapolis, which is not noted for sculptured monuments. Sculpture of any kind would have been considered idolatrous. Jewish tradition states monuments should not be elaborate but plain, (see surrounding tombstones for typical Jewish monuments). Second, the book would be understandable if this were a male buried here as it would possibly represent a student or Rabbi noted for the study of the Torah; but this is a women’s tomb. And last, this type of tombstone was often used by the Church of Jesus Christ of Latter Day Saints (Mormons) in the Midwest during the late 1800’s and sometimes had two books atop each other – representative of the Bible and the Book of Mormon. The reasons for such a monument in a Jewish cemetery is indeed a mystery.